Inorganic Chemistry, Second Edition, provides essential information for students of inorganic chemistry or for chemists pursuing self-study. The presentation of topics is made with an effort to be clear and concise so that the book is portable and user friendly. The text emphasizes fundamental principles—including molecular structure, acid-base chemistry, coordination chemistry, ligand field theory, and solid state chemistry. It is organized into five major themes (structure, condensed phases, solution chemistry, main group and coordination compounds) with several chapters in each. There is a logical progression from atomic structure to molecular structure to properties of substances based on molecular structures, to behavior of solids, etc. The textbook contains a balance of topics in theoretical and descriptive chemistry. For example, the hard-soft interaction principle is used to explain hydrogen bond strengths, strengths of acids and bases, stability of coordination compounds, etc. Discussion of elements begins with survey chapters focused on the main groups, while later chapters cover the elements in greater detail. Each chapter opens with narrative introductions and includes figures, tables, and end-of-chapter problem sets. 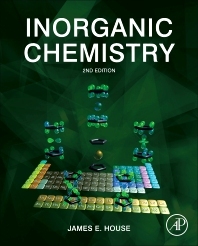 This new edition features new and improved illustrations, including symmetry and 3D molecular orbital representations; expanded coverage of spectroscopy, instrumental techniques, organometallic and bio-inorganic chemistry; and more in-text worked-out examples to encourage active learning and to prepare students for their exams. This text is ideal for advanced undergraduate and graduate-level students enrolled in the Inorganic Chemistry course. This core course serves Chemistry and other science majors. The book may also be suitable for biochemistry, medicinal chemistry, and other professionals who wish to learn more about this subject area. This text is ideal for advanced undergraduate and graduate-level students enrolled in the Inorganic Chemistry course. This core course serves Chemistry and other science majors. The text may also be suitable for biochemistry, medicinal chemistry, and other professionals who wish to learn more about this subject area. J.E. House is Scholar in Residence, Illinois Wesleyan University, and Emeritus Professor of Chemistry, Illinois State University. He received BS and MA degrees from Southern Illinois University and the PhD from the University of Illinois, Urbana. In his 32 years at Illinois State, he taught a variety of courses in inorganic and physical chemistry. He has authored almost 150 publications in chemistry journals, many dealing with reactions in solid materials, as well as books on chemical kinetics, quantum mechanics, and inorganic chemistry. He was elected Professor of the Year in 2011 by the student body at Illinois Wesleyan University. He has also been elected to the Southern Illinois University Chemistry Alumni Hall of Fame. He is the Series Editor for Elsevier's Developments in Physical & Theoretical Chemistry series, and a member of the editorial board of The Chemical Educator.